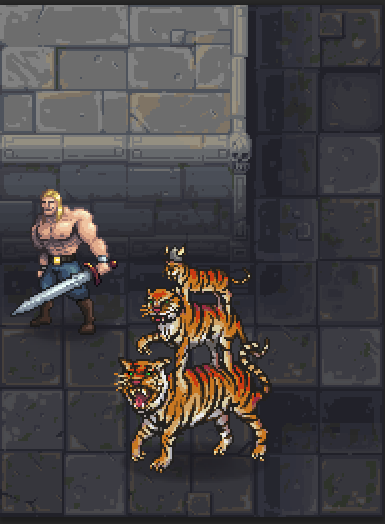 Alpha 2.01s Update » Dungeonmans! The latest version of Dungeonmans Early Access is now available! If you’ve already picked up an Early Access version, you can grab the latest version from your Humble library. If you haven’t joined us in Early Access, what are you waiting for!? Fixed bug where selecting “Sell all my unequipped gear” would cause all sorts of failures, including sale of your equipped gear and save corruption. Not fixed: Rare hanging on shopkeeper interaction. If this happens to you, please let me know via jim@dungeonmans.com. Power hotkeys and the quickslot bar are cleared on death. This fixes many situations where powers would fail to activate from bogus requirements. Mouseover tooltips should now work on the quickslot bar. Fixed rare crash caused by Hammer and Anvil power. Dashing Charge no longer is blocked by adjacent enemies, and also deals additional Bleed damage on each strike. Bandit Sparktossers and other enemies who use Villain Cloud now have less clones to attack through, and a longer cooldown between casts. In an effort to keep Dungeonmens adventuring onward, the rewards for fighting monsters weaker than you in less-dangerous areas are reduced. At the top of the screen you can see the approximate danger level of the area you are in. When you have notably outleveled the content in an area, it becomes Trivial– a mere annoyance for a champion like yourself. What does that mean? The area you’re fighting in is marked as Trivial. You are higher level than the monster. The monster is not a Boss, Champion, Ancient King, or other specialty monster. Trivial monsters give no XP or loot when killed, and often cause your hero to yawn in boredom. If you are about to enter a dungeon from the overworld that is Trivial, you’ll receive a warning about that and the dungeon will only have one floor. Will this encourage exploration or cause lesser Dungeonmens to grind scrobolds and puppy molds for Proofs of Stremf? Many more status effects have been correctly tied to your Science score. Stat potions in particular gain a notable benefit from Science. If you need to really put the hurt on some monsters, a Potion of Stremf can make that happen. If you have a round or two to plan ahead (and of course you do, because you’re Careful, Cautious and On Guard) you can pre-game with a Potion of Science. Enjoy this madness before the nerfs come down.